So I ran into a little problem today while using Outlook 2007. I wanted to see who the originating IP address was of the person who had just sent me an e-mail. 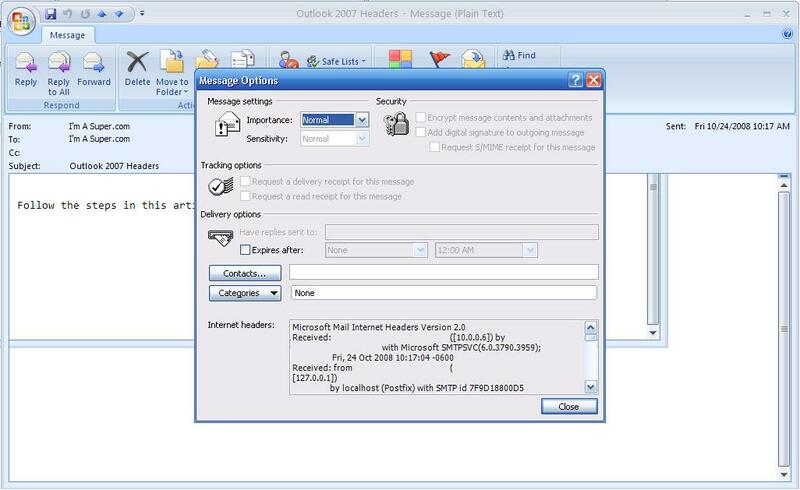 Finding an originating IP in your in your internet email headers used to be a pretty easy thing to do in Outlook Express, MS outlook 97-2003, but with the whole new GUI change (what with the Ribbons and all) in 2007, it’s a lot harder to find. As demonstrated in the picture above, click on the little box with the small arrow in the bottom left corner. This brings up the Message Options window, which will show your headers under the section “Internet Headers”. That’s it, that’s all there is to it. Now you can track down your message senders (maybe they were harassing you?) and find out what’s going on behind your e-mail scene. This entry was posted in Technology. on October 24, 2008 by I'm a Super .com.